We are pleased to welcome Dr. Sara Weisenbach. 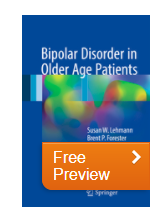 PhD, ABPP as a Co-Chair of the Geriatric Mood Disorder Task Group. 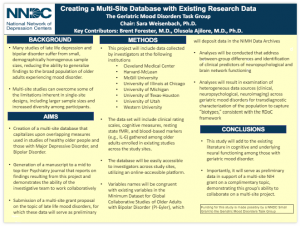 Under her leadership, the Geriatric Mood Disorders Task Group will discuss goals of common interest in the area of geriatric mood disorders including NNDC data analysis projects and collaborative multi-site studies. Dr. Weisenbach will also encourage NNDC sites to recruit older cohorts of individuals with mood disorders to improve our capacity for studying larger numbers of older adults with a goal of exploring age effects. Forester BP, Ajilore O, Spino C, Lehmann SW.
Am J Geriatr Psychiatry. 2015 Sep;23(9):977-84. doi: 10.1016/j.jagp.2015.01.001. Epub 2015 Jan 15.